Volkswagen is accelerating its roll-out of electric cars, Wolfsburg confirmed at its 2019 annual conference. It revealed plans to launch almost 70 electric vehicles (EVs) by 2028, instead of the 50 it had previously planned. That'll mean 40% of cars sold by 2030 will be battery powered across the VW Group (including Audi, Seat, Skoda, Porsche and others). As a result, the projected volume of EVs to be built upon its electric platforms will spiral from 15 million to 22m, bringing crucial economies of scale - useful when all car makers are desperate to push down the cost of electrification. Committing to higher volumes will secure lower unit prices for batteries and power controllers necessary to electrify a car. The group also committed to going carbon neutral by 2050; it is analysing its CO2 output at every step of manufacturing, from factory floor to external supply chains. Read on to find out more about VW's electric car plans: we've scooped the next-gen models on test and explain how the MEB electric car architecture works below. VW is busy testing its new range of electric cars, crossovers and vans - and our man with the long lens has spotted the latest VW EVs on chilly winter test in Sweden. Two prototypes were spotted this week and we believe they are test mules for the ID Crozz SUV and other spin-off derivatives. They're based on the group's new MEB electric architecture that we explain in detail below. Electrification is a major plank in VW's turnaround strategy in the wake of the emissions scandal and in this handy explainer, we spell out which electric cars are being developed, the technology underpinning them and even the charging infrastructure being planned by Wolfsburg. This ID Crozz mule lurking under a Golf SV bodyshell (below) is set to come in two bodystyles for production: a conventional SUV and a sportier-looking coupe/crossover mash-up, the latest trend in SUV-kind. The electric ID brand is as significant to Volkswagen as the Beetle was in 1945 and the original Golf in 1974. In their different ways, they transformed the company. Can ID do the same at a time when VW is still being buffeted by the aftershocks of Dieselgate? This is a revolution in vehicle design and manufacture that’s about to get very real, with VW committed to putting its first production ID on sale in 2020 for the price of a decent Golf diesel. In late 2018 a senior board member was quoted by Reuters saying that VW would stop building internal combustion engines by 2026. While VW isn’t dropping petrol and diesel just yet, its investment in electrification is vast; there’s no turning back now. The only question is how long the electric and internal-combustion product lines will co-exist. The £5.3bn programme includes £1.1bn at its Braunschweig, Salzgitter and Kassel sites, with a further £1bn at Zwickau. That investment in production capacity is necessary because VW expects to be building 100,000 ID models in 2020, rising to 10 times that in 2025. With an anticipated 10 million vehicle sales across all VW Group brands during the first wave of electrification, there’s been considerable focus on component sharing and cost cutting. The use of an all-steel platform will help; it’s far cheaper than a lightweight aluminium alternative. But the big cost challenge will be in the less familiar area of battery costs. 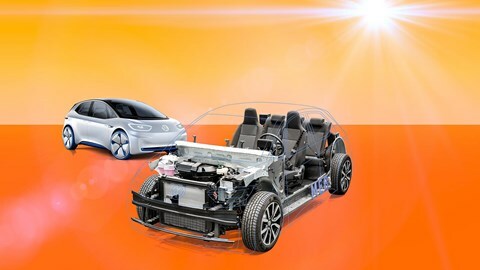 As VW makes the transition from internal combustion to electrification, it needs to not only master the use of batteries but secure a reliable, cost-effective supply of the raw materials, while being on the lookout for technical advances. Like the MEB, the battery pack is modular. According to the new WLTP assessment, the entry-level battery will offer 200 miles of range. The next step up is around 270 miles. A third, yet to be confirmed, is expected to hold enough charge to offer a 340-mile range. Initially, the entry hatch in 2020 will only get the middle-sized battery, expected to be 48kWh; the most powerful is likely to debut in an SUV. The lithium-ion batteries (above) are still undergoing development, according to Dr Armin Modlinger, responsible for developing cell technology for all the VW brands; he’s based at the pilot line for battery cell production being built in Salzgitter. VW is using both prismatic and pouch cells for the most efficient packaging and easier handling. ‘We need to increase the energy density to improve range by adding more nickel to the cathode and silicon to the anode,’ he said. Crucially, because the ID range will be built on a global scale, including the USA and China, the batteries are ‘cell agnostic’ – able to accommodate locally produced cells. According to Modlinger, solid state batteries – with their improved safety and higher energy density – are not likely to appear until the end of the 2020s. The first-generation ID, built on the new MEB platform, will be made alongside the eighth-generation Golf, using the MQB platform. Petrol, diesel and electric will all be constructed under one roof. Transition could take more than one generation. VW is on a steep learning curve with lithium-ion batteries: it’s not only developing them but also mass-producing them. Each has around 2500 components when connectors, cooling and management systems are included. For Euro-built cars, battery production is concentrated at Braunschweig, able to make 500k a year. Different batteries and different motors can be slotted in relatively easily, and different bodies put on top. Basic ID hatch has motor in the back, nestling among multi-link suspension, and rear-wheel drive. SUV will have an additional motor – positioned with the heating system under the front bonnet – and all-wheel drive. The first production ID will be a Golf-sized hatchback, launched at the same time as the next-generation Golf. Expect roughly similar price and performance, but Passat-level cabin space, taking advantage of the lack of ICE engine and transmission. Volkswagen has announced a new mobile quick charging station that can be delivered anywhere to power its forthcoming range of electric cars. Designed to enable a quicker ramping-up of the EV infrastructure, VW reckons these portable chargers are a great way to scale up quickly and support events such as festivals where there might be a temporary need to charge electric cars. Each unit has a capacity of 360kWh and can charge up to 15 electric cars, VW claims. Time to recharge? An average of 17 minutes, making for ultra-fast recharging at 100kW. The pods are being trialled in Wolfsburg in 2019, before being rolled out to other cities in 2020 to coincide with the launch of VW's new ID range of EVs.